What’s New for the 2013 Nissan Quest? For the 2013 model year, the Nissan Quest gets a few updates to its equipment packages. The top-of-the line LE model gets an Around View monitor, which provides a complete above-the-vehicle view, making parking in close quarters simple. Also, the DVD Entertainment option is now available in the base-level SV trim, where previously it was not. If you’re looking for a minivan with unique style, you’re in luck. 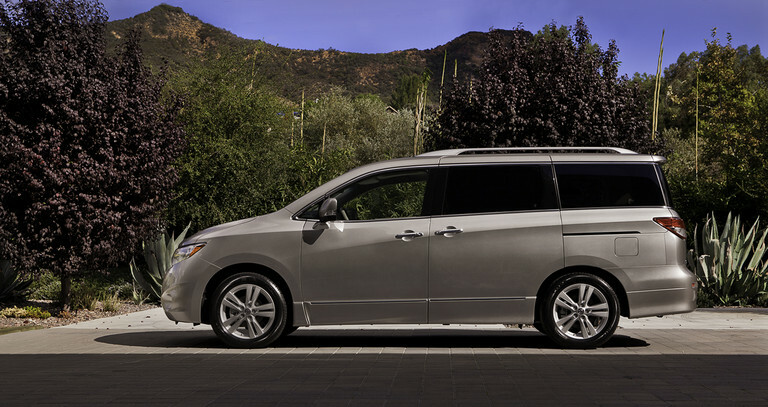 The Nissan Quest is without question the most distinctive-looking minivan on the market. With bold, square lines in the rear, and refined curves leading the way in the front, this is one minivan that stands out in a segment of otherwise similar looking vehicles. The Nissan Quest is actually a fun minivan to drive, thanks to its smooth, powerful engine, and responsive handling. The Quest is powered by a 3.5-liter V6 with 260 hp and 240 lb-ft of torque, and a continuously variable transmission (CVT) sends power to the front wheels, seamlesslygetting the most out of its V6. Fuel economy is on par with the Quest’s competitors, earning EPA estimates of 19 mpg city, 25 mpg highway, and 21 mpg combined. The 2013 Nissan Quest offers an array of features and conveniences any family will appreciate. The interior boasts high-quality materials, even at the base level, plus a smart, appealing design. The dashboard flows into the door panels, and the controls are well laid out and easy to navigate. Higher trim levels feature soft-touch materials and modern technology that sets a new standard for minivan luxury. The second and third rows easily fold forward and flat, making it a snap to convert the Quest from a passenger van to a cargo van when needed. The 2013 Nissan Quest comes standard with antilock disc brakes, stability and traction control, front-seat side airbags, full-length side curtain airbags, and front-seat active head restraints. A rearview camera is now standard on all models, with the exception of the base S trim. The Insurance Institute for Highway Safety awarded the Quest its top rating of “Good” in its frontal-offset and side-impact collision tests, making this a minivan in which you can feel confident about transporting your family.